Epistemic status: trying to share a simplified model of a thing to make it easier to talk about; confident there’s something there, but not confident that my read of it or this attempt at simplification is good. This post is a rewrite of a talk I gave at a CFAR event that seemed well-received; a couple of people who weren’t there heard about it and asked if I’d explain the thing. I tried to write this relatively quickly and keep it relatively short, which may mean it’s less clear than ideal - happy to hash things out in the comments if so. The thing is much easier to describe if I occasionally use some woo-y language like “aura” and “energy” to gesture in the direction of what I mean. I’ll put these words in quotes so you know I know I’m being woo-y; feel free to mentally insert “something-you-might-call-” before each instance, if that helps. Rationalists love talking about status. And that’s great - it’s a useful idea, for sure. But I think in our eagerness to notice and apply the concept of status, we end up conflating it with a related-but-different thing. I also think the different thing is super useful in its own right, and important to understand, and I hope sharing my relatively basic thoughts on it will also let others build off that beginning. So this post is my attempt to explain that different thing. I’m going to call it “making yourself big” and “making yourself small”. Let’s start with an animal showing how it’s done. This video popped up in my feed recently, and is an amazing example of an animal (the goat) “making himself big”. To us, it’s obvious that the bull could flatten the goat in any real contest. But the bull doesn’t know that! He’s not reasoning about relative mass or propulsive power; he’s responding purely to how “big” the goat is making his “aura”. Watch the video and see if you can notice specifically how the goat is doing this. 0:07 - where the goat rears up - is an obvious moment, but I claim 0:30-0:36 is even better, where the bull feints forward a couple of times while the goat stands firm, using his posture to “project” his “energy” irrepressibly forward. The bull is simply unable to continue toward him. The next two examples are of a human working with horses, to show examples of it looks like for a human to be big or small. First, getting big. The clip I’ll link to shows a stallion who was abnormally poorly trained, plus probably suffered some brain damage as a foal, who as a result is abnormally aggressive. The trainer, therefore, needs to make himself much bigger than is normally necessary to keep the stallion away from him. Watch 0:30-0:50 of this video (warning: the video is slightly graphic if you watch all the way to the end). See how the trainer uses his flag and motion/”energy” towards the stallion to make himself bigger, which pushes the horse away from him - without using any physical contact? Notice that the trainer does not hit the horse. (The motions he’s making may look like threats to strike, and it’s true that “making yourself big” ultimately rests on implied threat, but it’s the same flavor of threat that the goat is making in the video above - made much more of bluster than of capacity to harm.) I’m pretty confident this horse has never been struck by a human in his life, and certainly not by this trainer. He’s not recalling previous pain caused by this human and moving back to avoid it; he’s just instinctively making space for how “big” the trainer has made himself. I found it harder to find a good clip of getting small, but I think this one of the same trainer working with a troubled mare is pretty good - watch 1:16-1:45 of this video. Can you see the moments where he is “smallest”? The first is at 1:33, where he’s physically walking away - he’s actually making himself so small that a “vacuum” is created in his wake, and the mare walks towards him to fill it. A more classic example is 1:41-1:45. Notice that his body faces away from the mare; he does not make eye contact with her; he moves slowly. In response, she’s able to be close to him, because his “aura” (unlike at 0:18-0:26, 1:16-1:21, or 1:39) is not pushing her away. Hopefully you now feel like you have some intuition for what making yourself “big” or “small” could mean at all. The above examples show “bigness” and “smallness” causing other animals to physically move their bodies; I claim that this type of body language is a significant part of how social mammals like cows, goats, and horses communicate with each other. So how does this apply to human-human interactions? 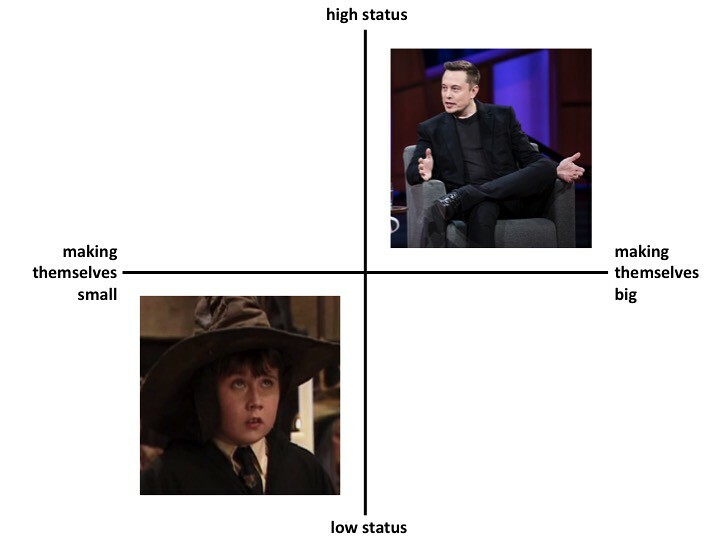 Before giving some human-to-human examples, here’s a simplified framework to distinguish high/low status from making yourself big/small. 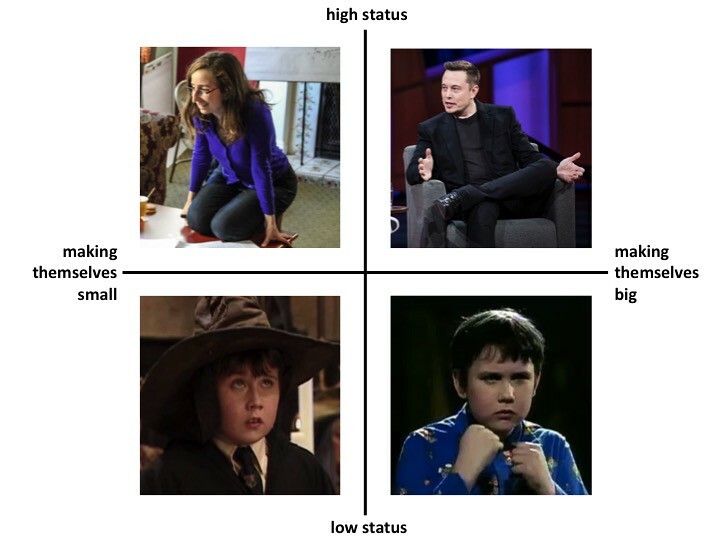 My low/big example is the very same Neville Longbottom of low/small fame. But this time, it’s Neville in a very specific scene - the one at the end of the first Harry Potter book, where he tries to prevent his friends from leaving the common room. As you may remember, this doesn’t end particularly well for him; indeed, making yourself bigger than the “size” that corresponds to how much status you have is often not a very successful move. The high/small example is even more interesting. The image is of Anna Salamon, one of the cofounders of CFAR. I don’t want to refer to teacher-Anna, who stands in front of a room and commands attention, but to mentor-Anna. Mentor-Anna (whom you probably meet in a setting where she is fairly high-status, as a teacher or organizer or generally a person-whom-others-seem-to-respect) sits in a circle with you, or across from you one-on-one, and makes herself small. She doesn’t play low-status - she doesn’t act scared or powerless or shy. Instead, she talks slowly, leaves plenty of silence for you to fill, physically takes up a small amount of space (with knees to her chest, or legs crossed and hands in front of her, or similar), often looks away from you, and doesn’t interrupt. In response, the people she’s talking with tend to be drawn out of themselves; they have space to reflect; they share half-baked plans and half-acknowledged insecurities. They “expand” to fill the space she has created. For the latter, probably the most important thing is your mental/emotional state - a friend suggested “not wanting to startle a small bird” as an mindset to inhabit, to encourage yourself to become “smaller”. This is the part of the post where videos of human-to-human examples would be really helpful. Unfortunately I found it tricky to come up with examples I could search for that aren’t just high/big or low/small (e.g. the classic “new kid takes down the bully” scene in lots of high school movies usually involves the new kid “getting big”, but also doing a bunch of high-status behavior, which doesn&apos;t seem very helpful for explaining). Given that this post has been sitting in “drafts” for a couple of weeks now, waiting for me to get around to finding better examples, I decided to go ahead and post it without more videos. Per the Anna example above, making yourself small is a really good way to non-explicitly encourage someone who seems shy/intimidated/reticent to feel more comfortable coming out of their shell. At the top, I said people often conflate high/low status with making yourself big/small. As an example, when meeting new people (e.g. at a party or networking event), you might go from thinking “higher status is better” to “I should make myself as big as possible”. But this often backfires, either because you become intimidating (see previous bullet) or because you infringe upon the “space”/”aura” of others, causing them to feel hostile/defensive/aggressive. Decoupling making yourself smaller from playing low status can help you make a much better impression - neither “loud and brash” nor “scared and shy”; more like “self-contained and confident”. In any context where you want the people around you to pay attention to someone else (e.g. if you’re making a joint presentation of some kind, and it’s their turn to hold the floor), making yourself small will make it easier for that person to take up the space and hold the attention of others. As with lots of interpersonal concepts, this can also be useful internally: if you’re familiar with internal double crux / internal family systems / other “parts-work”, play around with the motion of having parts of yourself make themselves small (or big). More generally, directing your “energy”/”aura” in other ways (beyond just “bigger”/”smaller”) - and noticing others doing it - can be useful in tons of situations. As a trivial example, try it the next time you’re in that situation where you bump into someone walking in the other direction, and the two of you can’t figure out which side to pass each other on. I hope those brief descriptions make sense just based on this post; if not, I can expand on in them the comments if there’s interest. I’d also be curious for what examples you can come up with (or notice in your daily life after reading the post). If you know me personally, I’m also happy to share more examples of specific mutual acquaintances who are noticeably good or bad at making themselves big or small. I think those would be be difficult and potentially privacy-invading to try to describe to strangers, though, so I’m not including them here. For the record, the style of horsemanship I like is pretty niche; you should not expect most people who work with horses to have heard the phrase “make yourself small” or to agree with me about what good horse training looks like. The horsemanship clips above are of Buck Brannaman, a trainer I highly respect. There’s a lot of skill and subtlety to what he’s doing in each clip (which I’d love to discuss with anyone interested), so I’d suggest not drawing strong conclusions about his methods based just on these short videos. If you’re really interested, I recommend this documentary about him, which I highly enjoyed but which might make less sense if you have less context on training horses. If you’re confused and/or curious about what Buck is doing in the video with the troubled mare: very roughly speaking, he’s 1) making himself big enough that the mare pays attention to him (which - do you see it? - is much less big than he needed to be with the stallion, because she’s not nearly as aggressive/oblivious); 2) showing her that if she’s paying attention to him, nothing bad will happen, and she can relax; 3) making himself small to allow her to approach him while in that relaxed and attentive state. I originally learned about the idea of making yourself big or small from The Birdie Book, by Dr. Deb Bennett. (The book is named for one of Bennett’s key ideas, which is that working with the horse’s attention/focus - which she nicknames its “birdie” - is a key part of understanding and communicating with horses.) I’m copying here a long passage from the book about getting small - feel free to skip, but I thought it might add some helpful color. One of the most moving things I ever witnessed in horsemanship was watching Harry Whitney help a frightened weanling filly. She had come from a breeding farm whose operators cynically demonstrate to clients their horses&apos; "brilliance" and "fire" by frightening them until they retreat with rolling eyes, trembling limbs and terrified sweating, to the back corner of a large stall. The filly&apos;s new owner, a woman from Arizona, very wisely brought her to us at a nearby ranch in California, for she knew that asking this animal to make the fifteen-hour trailer trip south in such a stressed and terrified state would likely kill her. The moment Harry entered the pen where the filly had been placed, she began desperate attempts to flee. The pen, which was much too high for her to jump out of, was enclosed by strong wire netting. This was fortunate for it did not permit her to injure herself, which she would most certainly have done otherwise. As it was, she crashed into and bounced off of it once and then, in blind terror, ran straight at Harry, half knocking him down. Harry&apos;s response was to retreat, very slowly, as far as he could get from her while she did likewise with respect to him. Physically as well as energetically, he made himself as small as possible. His flag (Harry&apos;s is made out of a collapsible fishing rod), remained stowed in his high-topped boots, as far out of sight as possible. Then, from a position squatting close to the ground in one corner of the enclosure, Harry began to help the filly make some changes. Every time she would glance out of the pen, Harry would reach down to his boot and just barely crinkle the flag. The first time he did this, the filly stared at him, the whites of her eyes showing, her feet frozen to the ground, her tense and trembling body leaning stiffly away. As soon as she rolled her eyes toward him, Harry would stop the crinkling sound and resume waiting quietly. Those of us who stood watching hardly dared to breathe. Our apprehension, however, proved unnecessary. As she spent more time regarding Harry, she began to relax. Soon she could stand still, relaxed, when Harry stood up completely straight. In another few minutes, he could take a step toward her - and then reward her for not fleeing by stepping away from her again. In half an hour, she was able to stretch her neck out to sniff his outstretched hand. A few minutes after that, Harry was petting her muzzle and her forehead. She found out it wasn&apos;t so bad. In fact, she liked it. The second day, Harry repeated the first lessons and in a few minutes the filly was able to permit Harry to place the halter around her muzzle, and then buckle it on her head. In the same way, he then taught her to lead: a little pressure from the rope, let her feel of it, let her figure out how to relieve the pressure by stepping up, then release even more slack to her. After each bout, the filly worked her jaws as she chewed things over in her mind. On the second day, the filly had two sessions with Harry, one in the morning and one in the afternoon, each of about 30 minutes&apos; duration. By the end of the second lesson that day, the filly was allowing Harry to touch her all over, pick up all four feet, and lead her anywhere in her enclosure, which included a stall plus a run. She could follow Harry in and out of the door, stepping daintily over the threshhold connecting the stall to the run. On the morning of the third day, Harry led her out of the stall. They walked all over the farm. If she showed indications that she might be getting "lost," Harry would crinkle his flag, or merely reach out to touch her. With this reminder of where her teacher was, she could relax again. It was clear that she wanted to be with Harry more than she wanted to be anywhere else. By the same internal process that underlies all affection - or if you like by the same miracle - he had become her trusted friend. He led her in and out of the owner&apos;s horse trailer, up and down the ramp, letting her find out all about it, and especially that it wasn&apos;t going to hurt her. Using his human powers of pre-planning and foresight, Harry never got this filly into trouble, never came close to breaking her thread. This allowed her to begin to develop a much wider scale for adjustment. Some people call this "equanimity," "resiliency," or "inner calm." Others call it "emotional maturity." On the afternoon of the third day, Harry handed the lead line to the owner. She had already learned much by watching the whole process for three days, and with a little support from Harry, she found to her delight that she too could pet, halter, lead, and load her filly and handle her feet. We all realized that they were both going to make it just fine to their new home in Arizona. When I expressed my admiration to Harry later in private, he said, "my biggest worry was that I might not be able to make myself small enough."